Carpal malalignment following the malunited distal radial fracture is described to develop as an adaptation to realign the hand to the malunion. It worsens gradually after healing of the fracture due to continued loading of the wrist. It is also reported to develop during the immobilization itself rather than after fracture healing. The present work was aimed to study the natural course and the quantitative assessment of such adaptive carpal realignment following distal radial fracture. In a prospective study, 118 distal radial fractures treated with different modalities were followed-up with serial radiographs for a year for assessment of various radiological parameters. Two patterns of carpal malalignment were identified depending upon the effective radio-lunate flexion (ERLF) measured on pre-reduction radiographs. The midcarpal malalignment was seen in 98 radial fractures (83%) with the lunate following the dorsiflexed fracture fragment and a measured ERLF of less than 25°. 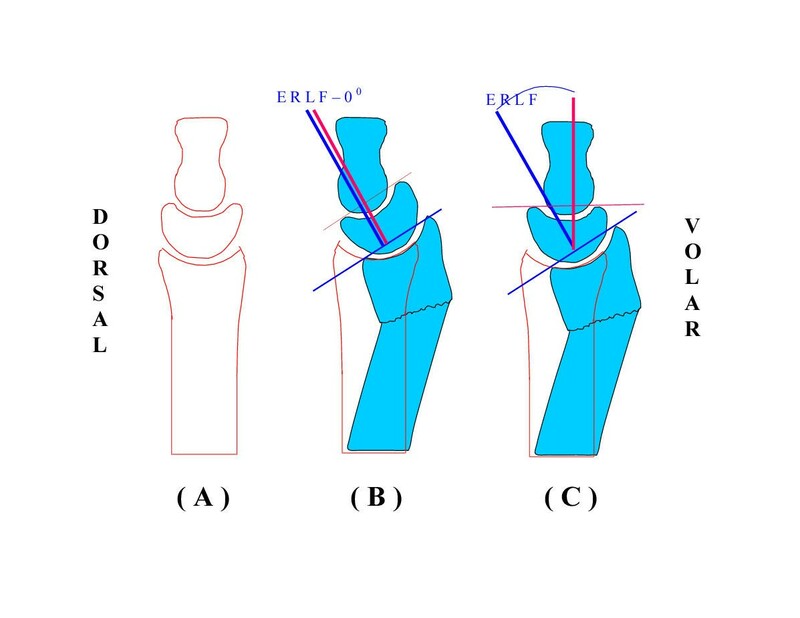 The second pattern of radio-carpal malalignment showed the fracture fragment to dorsiflex without taking the lunate with a measured ERLF of more than 25°. The scaphoid did not follow the fracture fragment in both the patterns of malalignment. It is better to assess distal radial fractures for any wrist ligamentous injury on the post-reduction film with the restored radial anatomy than on the pre-reduction film since most carpal malalignments get corrected with the reduction of the fracture. Similar carpal malalignment reappear with the redisplacement of the fracture as seen in pre-reduction radiographs and develops during the immobilization rather than as a later compensatory mechanism for the malunion. Carpal malalignment following the malunited distal radial fractures was recognised as "dorsal luxation of the capitate" in 1919  and is the cause of the substantial morbidity even today [2–4]. The malalignment has been described to reflect an adaptation to realign the hand with the malunion at the midcarpal level , though the observation that "commonly after malunited fractures of the distal radius, compensatory angulation to realign hand to the forearm takes place at the radiocarpal level" has also appeared . There has been so far no study describing this adaptive carpal realignment in quantitative terms with precise anatomical details. This made us conduct the present study with an objective to identify and measure accurately the various adaptive carpal malalignments with particular attention towards contribution from the individual carpal bones in the proximal carpal row. 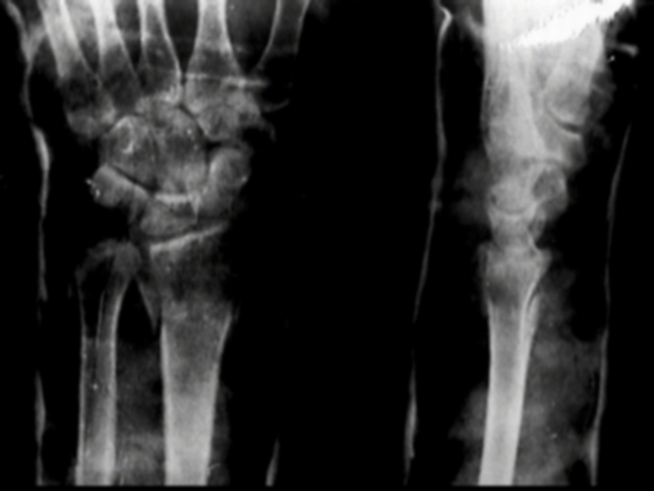 Patients with malunited distal radial fractures were reported to develop gradual progression of the midcarpal malalignment after the healing of the fracture, which worsened with the continued loading of the wrist . Patients have also been reported to develop adaptive carpal realignment during evolution of the malunion itself, during and after the immobilization rather than after fracture healing . They also described the carpal malalignment as not simply a complication but the inevitable response of the carpus to the altered mechanics caused by the malunion with dorsal radial tilt. However, it was our observation that the so described inevitable carpal realignment does not follow malunions of those fractures which are associated with dorsal subluxation of the radio-carpal joint. These fractures form nearly 11% of the total displaced distal radial fractures . With such controversial reports regarding carpal malalignment following the distal radial fractures, we thought it worthwhile to study the incidence and the natural course of the various carpal malalignment patterns occurring secondary to the displaced distal radial fractures. The present study, therefore proposed to measure various radial and wrist radiological parameters following distal radial fractures in pre-reduction, post-reduction and the serial follow-up films with a view to quantify accurately the displacement of the fracture and the associated carpal malalignment. This prospective study comprised patients with 118 displaced distal radial fractures. The mean age of the patients was 49.21 years (SD 16.83). There were 70 males and 45 females. Three patients had bilateral fractures. Fractures were classified according to the Association for the study of internal fixation (AO/ASIF) . The distribution of patients according to the type of the fracture and the treatment is given in Table 1. The patients were radiographed before and soon after the reduction of the fracture and at follow-up at two, six and twelve weeks, six months and one year after the injury. The detailed assessment made for the various radiographic parameters was as follows. a/ Radial angulation: averages 22° with a range of 12° – 30° and b/ Radial length: averages 9 mm with range of 8–14 mm . The other parameters like scapho-lunate gap, ulnar variance, radial shift, articular incongruity and three Gilula's arcs etc. were not measured, as they were considered not relevant to the scope of the present study. Values for the various radiological parameters on the initial, post-reduction and late radiographs are shown in Table 2. The measurement of ERLF made us identify two patterns of carpal malalignment: the first pattern was of the midcarpal malalignment with ERLF of less than 25°, where the lunate also rotated dorsally along with the fracture fragment and maintaining nearly a collinear relationship with it (Fig. 1b). The second pattern was of the radio-carpal malalignment with ERLF of more than 25°. It involved the fracture fragment rotating dorsally independent of the lunate. The lunate was seen placed precariously along a dorsally tilted distal radial articular surface, resulting in dorsal radio-carpal subluxation (Fig. 1c &6). These fractures comprised 17% of our total patients (Table 3) and were difficult fractures to attain satisfactory reduction in terms of restoration of volar tilt and had increased incidence of redisplacement (Table 2). The scaphoid did not follow the dorsiflexed fracture fragment in both the patterns of the carpal malalignment. The radio-scaphoid and the scapho-capitate angles did not show significant change among the pre, post-reduction or the follow-up films in both the patterns of fracture. It was seen that fractures when redisplaced followed the same pattern of carpal malalignment as seen at the time of injury. Diagrammatic representation of the two patterns of carpal malalignment (a) intact radius with the normal wrist joint. RLA and VT, both have been drawn as zero for easier understanding, (b) distal radial fracture with the midcarpal malalignment. Lunate and the fracture fragment both are rotated dorsally together as one piece. The lunate's axis and the axis of the distal radial articular surface, both maintain nearly collinear relationship with ERLF measured as zero, (c) distal radial fracture with the radio-carpal malalignment showing dorsal rotation of the fracture fragment alone without taking the lunate with it. Lunate is seen maintaining the neutral alignment but acutely subluxed dorsally with ERLF of more than 25°. Two types of carpal malalignment are recognized following the malunited distal radial fractures: "adaptive" midcarpal malalignments and pathologic radio-carpal malalignments [5, 12]. In the first type, neither the radio-carpal capsule nor the carpal ligaments are disrupted; the malalignment reflects just the adaptation to the malunion at the midcarpal level. In the second type, the fracture also results in a global radio-carpal dorsal derangement producing the dorsal subluxation of the radio-lunate joint. There had been no description to quantify dorsal subluxation of the radio-lunate joint, which is necessary before labeling all such fractures to have pathological radio-carpal malalignment with global radio-carpal dorsal disruption. The measurement of ERLF helps to classify carpal malalignments into two definite groups with possibly two different etiopathogenesis and prognosis [11, 12]. 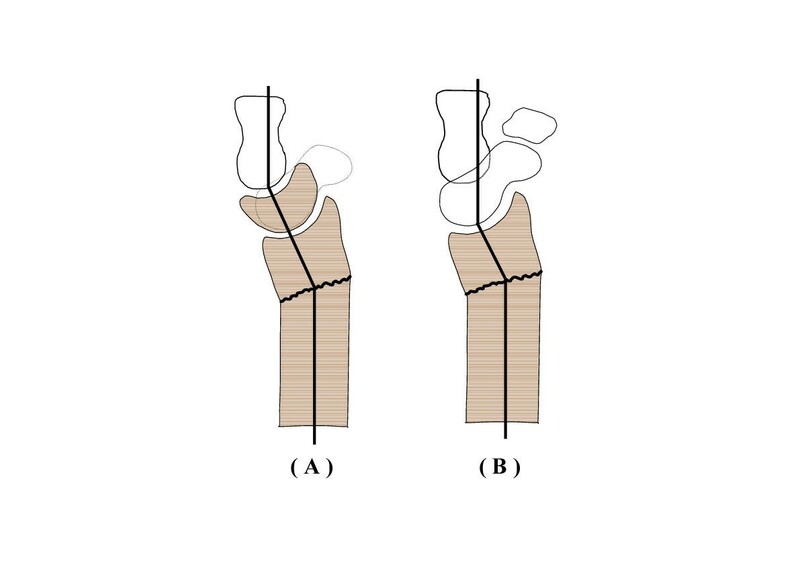 Fractures with less than 25° of ERLF were considered to be belonging to the group of the "adaptive" midcarpal malalignments, which formed 83% of the total fractures in our series. Fractures showing more than 25° of ERLF, which denotes an excursion definitely beyond the physiological range, formed the group of pathologic radio-carpal malalignment with an incidence of 17% in our series though it has been reported to vary from 8% to 10.6% [4, 13]. In an experimental study, associated injury to the radio-carpal ligaments has been suggested to explain the occurrence of such an injury pattern . Dorsal rotation of the distal radial fracture fragment necessarily produces flexion at the adjacent wrist joint and therefore involves similar alteration in radio-carpal or the intercarpal relationship. The wrist flexion involves the scaphoid moving more than the lunate by an average of 17° . This makes the proximal carpal row move in a columnar manner with the least excursion at radio-lunate joint. That is why; the inherent flexion of the wrist associated with the dorsal rotation of the fracture fragment causes the lunate to move with the fracture fragment like a composite radio-lunate complex. 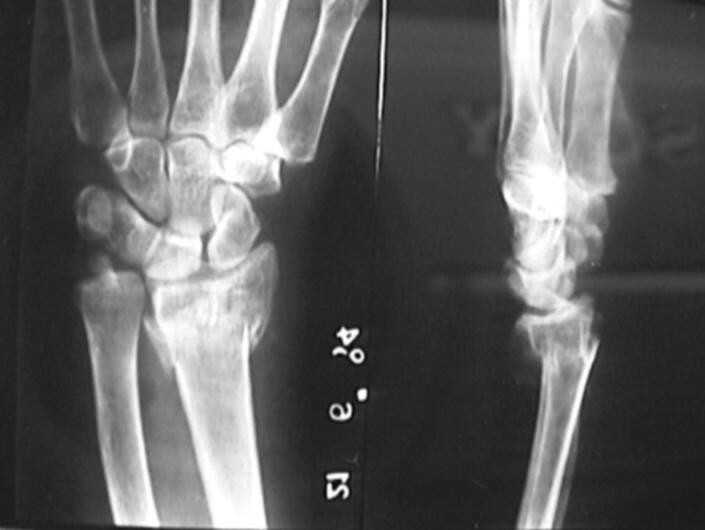 This occurs in most distal radial fractures producing the commonest malalignment pattern of the midcarpal type. It is noteworthy, however, that the pattern of malalignment in all these cases was not found entirely to be at the midcarpal level. The middle column of the wrist comprising the radius, lunate and the capitate, realigned to the malunion at the midcarpal level while the lateral column comprising of radius, scaphoid, trapezium and trapezoid got realigned at the radio-carpal level (Fig. 2). Fractures when redisplaced developed various carpal malalignment patterns during the immobilization itself (Fig. 3,4,5). The carpal malalignment secondary to the malunited distal radial fractures therefore is seen to occur as an integral component of the fracture redisplacement rather than as a necessary sequel to the malunion. Midcarpal malalignment across the two columns of the wrist; the proximal carpal row does not realign to the angulated radius in the pattern of a row but in a columnar manner. a/ middle column of the wrist comprising of radius, lunate and the capitate demonstrates adaptive angulation at the midcarpal level while, b/ the lateral column comprising of radius, scaphoid and the trapezium, trapezoid shows adaptive angulation at the radio-carpal level. Note, all fractures with both the patterns of carpal malalignment maintain the normal RSA since scaphoid is never seen to rotate with the fracture fragment. A distal radial fracture with midcarpal malalignment demonstrating dorsally rotated fracture fragment taking the lunate with it thus increasing the RLA and the SLA. Scaphoid does not follow the fracture fragment maintaining the normal RSA. The post-reduction radiograph showing satisfactory reduction with almost complete restoration of volar tilt. Note carpal alignments including RLA and the SLA within the normal configuration. 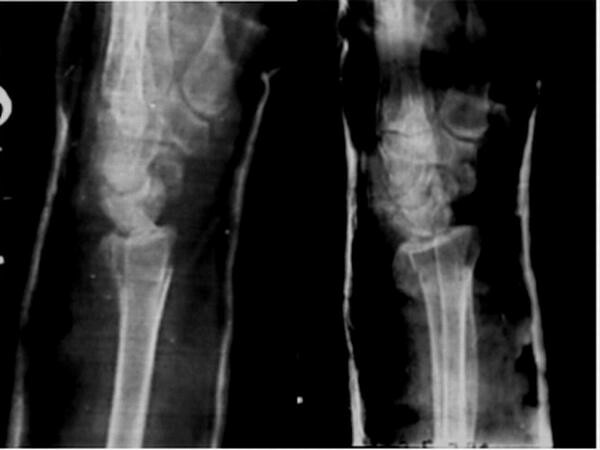 Two and four weeks post-reduction lateral radiographs showing progressive loss of the fracture reduction. Note progressive worsening of the carpal alignment with increase in the SLA, occurring simultaneously with continuing redisplacement of the fracture. One-year old malunited distal radial fracture with radio-carpal malalignment showing ERLF of more than 25°. The carpal realignment is seen to occur entirely at radio-carpal joint producing its flexion at a magnitude much beyond the normal excursion. Lunate is seen dorsally subluxed though maintaining the normal RLA. Pre-reduction radiograph of most fractures with midcarpal malalignment showed an increased SLA (Table 2). Twenty-four (20.3%) of our patients had SLA exceeding 60°. An increased SLA has also been reported to occur in association with distal radial fractures . The average SLA has been described to be 46° with range of 30°-60° . The wrist flexion is reported to show increased SLA with an average of 63° against 51° in the neutral wrist position while the wrist extension produces decreased scapho-lunate angle with an average of 36° due to the variable rotation of the carpals of the proximal row . We feel the increased SLA found to occur with displaced distal radial fracture in pre-reduction radiographs may be the result of the effective flexed position of the wrist joint due to the dorsal radial tilt and should not always be interpreted as injury to the scapho-lunate complex. The increased SLA and the midcarpal instability with an extended lunate could almost always be corrected with reduction of the fracture (Table 2). Similar observations were made where the instability has most appropriately been described as pseudo-DISI (dorsal intercalated segmental instability) though only as a case report . However, a study of thirty two patients observed scapho-lunate angle not to show much changes in pre / post-reduction and the one year follow-up radiographs . This is not in conformity with our findings. The proximal carpal row is an intercalated segment with no motor attached to it. Its alignment is dictated largely through the adjacent contact surfaces, various extrinsic and intrinsic ligaments and the position of the wrist. Any carpal malalignment, therefore, would be able to provide better functional assessment if measured in relation to the adjoining articular surfaces rather than the longitudinal axis of the radius. Carpal angles measure the alignment of the carpal bones in relation to the longitudinal axis of the radius but are able to serve the desired purpose due to the fixed and constant relationship between the long axis of the radius and its articular surface in an unbroken radius. That is why ERLF appears to be a more appropriate measurement in patients with distal radial fractures. Carpal angles are measured with wrist in neutral position but the measurements may prove erroneous if applied to patients with distal radial fractures with an associated implied wrist flexion. This is evident from the measurements of the SLA, which falsely show increased values on pre-reduction radiographs of the fractures with midcarpal malalignment due to the associated wrist flexion. 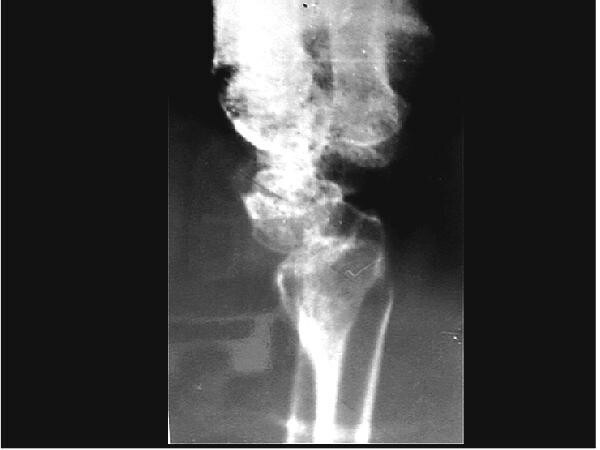 It is suggested that scapho-lunate dissociation should be suspected in fractures with increased SLA and the radio-scaphoid angles but in post-reduction radiographs only. The diagnosis may be strengthened further if the scapho-lunate gap is also increased. Two patterns of carpal malalignment: midcarpal and radio-carpal, were associated with displaced distal radial fractures. The carpal malalignments corrected with reduction of the fracture and were indeed pseudo instabilities. The same instability pattern reappeared with the redisplacement of the fractures and occurred during the immobilization itself rather than as a later compensatory mechanism of the malunion. Fractures with the radio-carpal instability pattern were difficult fractures to attain satisfactory reduction and had increased incidence of redisplacement, thus suggesting an indication for surgical treatment. The abnormal carpal angles seen in the patients with the displaced radial fracture may often be the result of the altered fracture biomechanics than an associated ligamentous injury. It is observed that the carpal measurements prove more informative if made with the restored radial anatomy on the post-reduction film. AG conceived, designed and coordinated the study along with drafting of the manuscript, SB carried out the study and participated in analyses, PJ carried out the study and participated in analyses, SS designing of the study and drafting the manuscript.